The dehumanising language deployed by national leaders and public figures when referring to people on the move has been well publicised. Metaphors for migrants broadly fit into three categories: animals/vermin, water or inanimate objects. For the first, we have ‘swarm’ (David Cameron) ‘infestation’ (Donald Trump), ‘cockroaches’ (Katie Hopkins), ‘flocking’ (Gordon Brown’s ‘bigoted woman’); for the second we have ‘flood’ (BBC), ‘tidal wave’ (Daily Mail) ‘inundation’ (CBS); and for the third we have ‘a bunch of’ (Cameron again), ‘stacked up’ (The Spectator) or even a ‘pool of skittles’ (Trump Jr). These have all been promptly reported and condemned, but beneath this intentionally offensive language, there lurks an official language, a specific jargon, deployed by government officials in its day to day operation of immigration enforcement. Like all jargon, it’s extraordinarily contagious, and so even those who oppose the government’s methods of immigration enforcement, and the narrative that underpins it, start to use it themselves. We end up being complicit. This is a dialect that’s no less hateful towards and disgusted by migrants, but it’s cloaked in the clinical language of administration. It is in fact more dangerous, because it’s the verbal scaffolding, the ‘supporting structure’, on which this government has built its hostile environment. This dialect is mobilised to articulate how, where, and on whom this hostility will be meted out. It’s deployed to justify the operation as a whole, one word at a time. But it’s so consistently used, and relatively well-disguised, that we all trot it out thoughtlessly. Some of the terms are obvious, but others seem innocuous, better disguised as a euphemism, or as an administrative term and so require more examination to unpick the racist, dehumanising, bullying or just patronising nuances of the term. In short, this is a naming of parts for immigration enforcement, with a focus on immigration detention. The Home Office caseworker looking at an individual case is often called the ‘caseowner’. While this is a term borrowed from the world of business, a term denoting ownership is clearly inappropriate in the context of immigration and asylum (as if they own that person’s future), even if it accurately reflects the absolute power these often under-qualified Home Office workers have over the lives of the people presenting their cases. The term ‘illegal immigrant’ is generally used to refer to anyone who has arrived in the UK irregularly, including those who have come in order to claim asylum, despite the fact that Article 31 of the Refugee Convention explicitly accepts that asylum-seekers may have to enter a country using irregular methods in order to claim asylum. Nevertheless, the narrative has become dominant, with even Diane Abbott claiming that she would make immigration enforcement more humane, while speeding up the removal of ‘illegal immigrants’. Worse, the term is often shortened to ‘illegals’. Favoured by the Daily Mail, this name has also been deployed by senior ministers. Before she was forced to resign as Home Secretary, Amber Rudd used the term when speaking to a Parliamentary committee. 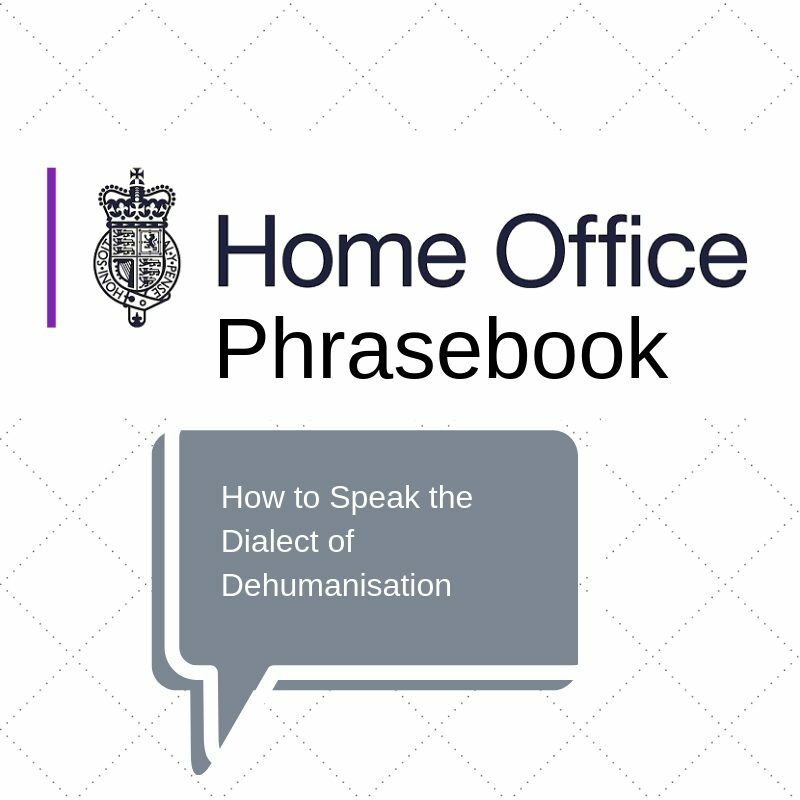 This was perhaps a slip of the tongue – official Home Office literature does not use this term – but it strongly suggests that this is the short-hand language used inside the department. The term is even more dehumanising than ‘illegal immigrant’, because to be an ‘illegal’ suggests that that is all you are, an illegal. As we will see, the distinction between being described as something, and being a/an something, is a crucial. This is a broad term used to describe those who have been convicted of any offence and who don’t have evidence of British nationality. It’s misleading. They may not have the correct papers, but many of those described as ‘foreign’ have been brought up in the UK, and may even have been born here (neither of which, under current nationality law, entitle someone to British nationality). The senior civil servant Stephen Shaw has talked about meeting people described as ‘FNOs’ in immigration detention who were ‘more British than foreign’, with ‘British accents’, who did not speak the language of the country to which they were due to be deported. Shaw’s ‘foreign-British’ scale is ultimately based on the same inherently racialised concepts of what it means to be British, but his observations do undermine the term ‘FNO’. The ‘Offender’ element to the term is also misleadingly menacing. Under the 2007 UK Borders Act, non-EEA citizens are automatically removed from the country if they have received a prison sentence of over a year. This is often simply an accumulation of minor offences such as theft or documentary forgery. As Thomas Kemp has written, the binary distinction between those classed as ‘Foreign National Offender’ – apparently ‘violent’ and ‘dangerous’ – and those in immigration detention to be removed under administrative powers, is misleading, and falls into the growing narrative that to be deserving of justice or humane treatment, you need to be ‘vulnerable’ and ‘innocent’. There are two problems with this. First, it should not be a requirement to be ‘vulnerable’ before the Home Office agrees to treat you in a dignified way. Every human should be treated humanely. 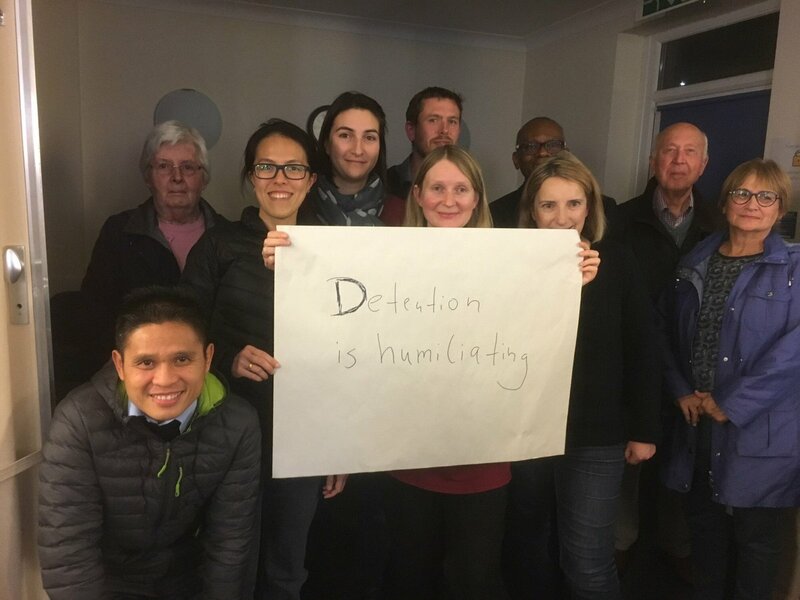 Second, as Freed Voices members Michael and Arrey recently told the Joint Committee on Human Rights, the ‘vulnerable’ / ’FNO’ distinction wrongly suggests that those who have been convicted of offences are somehow less likely to be harmed by detention. There is no evidence to suggest this. As Michael stressed, detention harms ‘every single individual…even the staff’. This goes back to the dangerous essentialising and reductive effect of the indefinite article in this context: you are a detainee, rather than someone who is detained. You are reduced to what has been done to you, and when you leave, you are an ex-detainee. 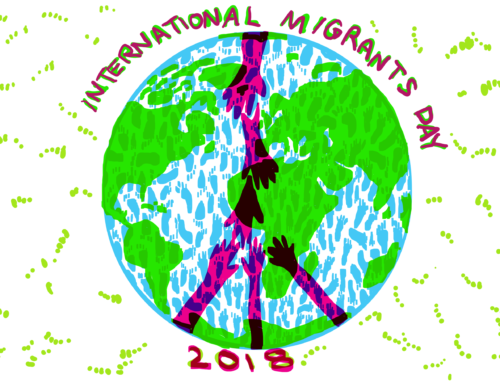 It needs be acknowledged that everyonein this field uses the term, from the Home Office to the most passionate opponents of immigration detention. We use it to avoid the clunky-ness of ‘someone who is/was detained’, but there is a strong case that we need to avoid this language whenever we can, as it creates an empathy barrier between those who haven’t been detained, and those who have. It’s easier to treat ‘a detainee’ inhumanely, than a person who has been detained. The same can be said of describing people as ‘an absconding risk’, ‘a deportation case’, ‘a level 3’ (referring to levels of evidence indicating a person is a survivor of torture), even ‘a migrant’ and ‘an asylum seeker’. Clearly, for the latter two, there are times when their use is appropriate and necessary, but the thoughtless and repetitive use of these terms risks alienating both users and audience from the people being described. One of the most extreme examples of the Home Office dialect of dehumanisation is the labelling of people as ‘subjects’ or simply ‘sub’. When a lawyer wishes to see the notes the Home Office has made on one of their clients, they are compelled to make a ‘Subject Access Request’, and (after significant delay) are sent a ‘Subject Access Bundle’ (SAB). The subject is the person. The SAB usually includes GCID (General Cases Information Database) notes, which are the notes Home Office caseworkers make about people. These disclosures provide an often shocking insight into the jargon used internally in that department: ‘the above subject arrived in the UK…subject has been granted a stay of removal’. Indeed, as can be seen, the Home Office caseworkers often don’t even dignify the individual with an article, definite orindefinite. But it’s not just caseworkers who deploy and ‘benefit’ from such dehumanising language. Legal practitioners are forced to use this terminology to request the Home Office notes about their client, and thus become anesthetised to the term. It also seems probable that, like the ‘rueful’ caseworker, many lawyers and activists are (subconsciously or not) happy to slip into a language that creates a protective barrier, an emotional safeguard, between them and the trauma of those with whom they work. We’ve become comfortably numb. The language around the methods of control is similarly revealing. It’s a securitised and militarised language, depicting a Home Office engaged in a noble fight against an external threat. To reflect this, the UK Border Agency was superseded by the UK Border Force (and a number of other bodies). The Home Office likes to characterise its immigration enforcement programmes as ‘operations’. You may not have heard of any of these – references to them are few and far between – but they pop up in Home Office disclosures to immigration lawyers and clearly inform the way the Home Office perceives its work. Nexus = connection; Perceptor, Magnify, Elucidate all convey a sense of shining a light on, uncovering and finding; Gull suggests a predatory ability to pluck someone out (from the Irish Sea? ); while Vaken (meaning ‘Awake’ in Swedish) and Adoze (literally to be dozing), both scream, ‘don’t get complacent…we’re coming to get you, you know not the day nor the hour.’ Adoze is darkly appropriate for an operation targeting rough-sleepers. Only Dickens, Crag and Gopik evade a connection with their purpose, though the latter two sound suitability militaristic and harsh. The names are threatening, dark, gothic, Wagnerian, but they also have an eerily video game sense about them. In the gamified world of immigration enforcement targets, this should come as no surprise. Home Office whistle-blowers have spoken out about a big poster on the Bootle (Liverpool) office wall ‘of a winding road with a plastic toy car attached, which was moved to indicate progress towards the 10,000 target [of clearing the backlog in asylum claims]’. Another whistle-blower has revealed that a toy gorilla, called the ‘grant monkey’, would be put on the desk of any caseowner who had granted asylum, as a badge of shame. I asked the Home Office to clarify how they come up with these operation names, whether there are other operations, and whether these links are simply coincidences. The media team hesitated before finally telling me that I’d have to make a Freedom of Information (FOI) request (which I duly did). At the time of writing I’ve received nothing; already a week after the statutory deadline for responses to FOIs. This gamification also extends into more general language of control. In the internal Home Office notes, one of my clients was arrested by ‘Direct Capture’. This openly violent phrase sounds like something that might flash-up after a successful operation in a video game like Call of Duty. Certain adjectives used to describe people being subjected to immigration enforcement also require scrutiny. On one end of the scale is ‘vulnerable’, as focused on in the ‘Adults at Risk’, a policy supposedly designed to protect those who are ‘particularly vulnerable’ to harm in detention. Protecting those who are particularly vulnerable to harm has been the drive of Stephen Shaw, and practitioners are increasingly forced to make representations to the Home Office focusing on why their client is particularly vulnerable. First, the focus on particularity is misleading since, as Romany Kisbee-batho has written in No Walls, the evidence is clear that everyone who is detained is harmed by the system. Second, the focus on vulnerability shifts the focus of the suffering to pre-existing issues, and away from the harm resulting from the violence perpetrated by the Home Office. Third, and as mentioned above, the focus on vulnerability plays into the dichotomy between the ‘good/innocent’ migrant, little lambs, ready to be rescued by Mama Britain, and the ‘bad’ migrant, wolves who need and deserve no protection. At the other end of the scale are those described as being ‘high risk’ to public safety. This phrase is often used as a justification for keeping a person in detention, even when they fit the Home Office’s criteria as ‘particularly vulnerable’. It’s an extremely vague term, used sweepingly to deprive people of their liberty, using logic that would be unthinkable for British citizens. One of my clients was considered a ‘high risk’ to the public because, were she to be released from detention, the British public would have ‘less trust’ in the Home Office. The Orwellian logic being that the public would be harmed by its own reduced trust in the Home Office. 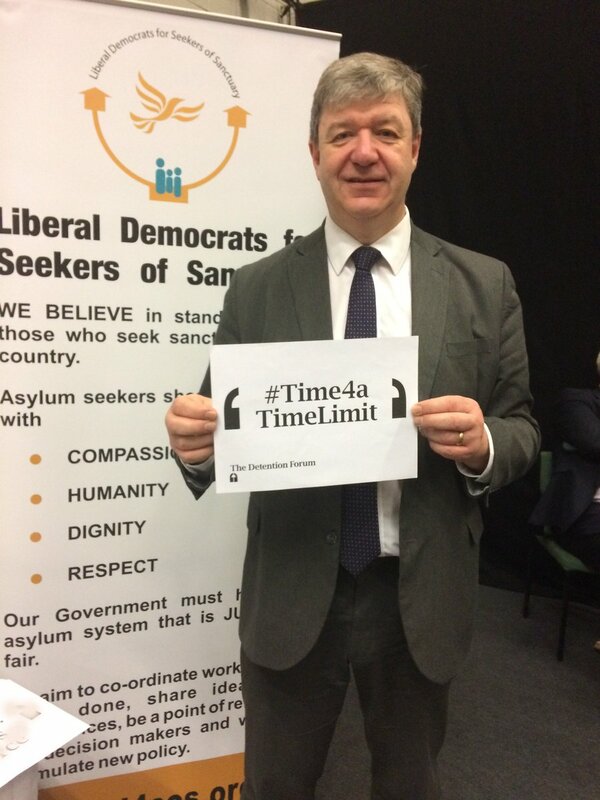 The Home Office often justifies detaining someone because, apparently, they cannot be trusted to comply with immigration enforcement, having shown disregard for the UK’s immigration laws by entering the country in a ‘clandestine’ way (in the back of a lorry, or by way of faked identity). Again, as described above, under the Refugee Convention a state cannot penalise someone for entering in an irregular way. Moreover, the use of the word ‘clandestine’ has unjustified connotations of cynical deviancy, of covert operations. The Home Office is keen on using the phrase ‘in the community’, to refer to life outside immigration detention. It seems innocuous, and is used by everyone in the field, but what it suggests is that those in immigration detention are notin our community. 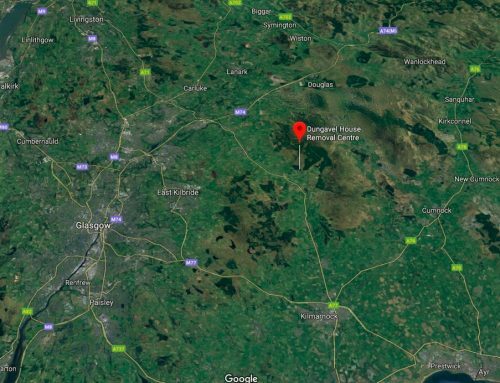 As Diane Taylor has written in The Guardian, they are neither prisoners nor free, they live in a ‘grey hinterland’, or as Rob Stothard has put it, the ‘seamed zones’. Robbed of visibility, ostracised from society, ignored by the public, people in detention are at the mercy of the Home Office. As one woman who has experienced detention put it: ‘this is the hostile environment on steroids’. Image of Heathrow IRC from Rob Stothard’s exhibition, The Seamed Zones. But this is a farce: fewer than half of those who are detained are eventually removed. Many people remain in these removal centres for months; some for years. This is just one form of misleading euphemism. ‘Clearance’ has replaced ‘removal’, and ‘housing’ suggests the benign intervention of the state to ensure that these women and families have a roof over their heads. The Serco-run centre is no doubt trying to detoxify its image after Channel 4 filmed officers racially abusing women in the centre, but the reality behind the glossy wording is starkly different. As I write, women are hunger-striking in a bid to improve conditions in the centre. The Home Office operates a policy of keeping people in solitary confinement in detention. 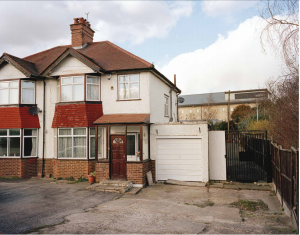 The Home Office claims that this form of segregation is used for control and protection. Our client, who challenged this practice in court, was segregated in the Kingfisher Unit of Yarl’s Wood. In other detention centres, the units are called variously and poetically ‘Care and Support Unit’/‘Eden Wing’ (Brook House), ‘Orchid Room’ & ‘Lavender Room’ (Tinsley House) or ‘Elm House’ (Harmondsworth). But these are no bucolic havens, they are places where people are held in isolation in poor conditions, often stripped of their phones. 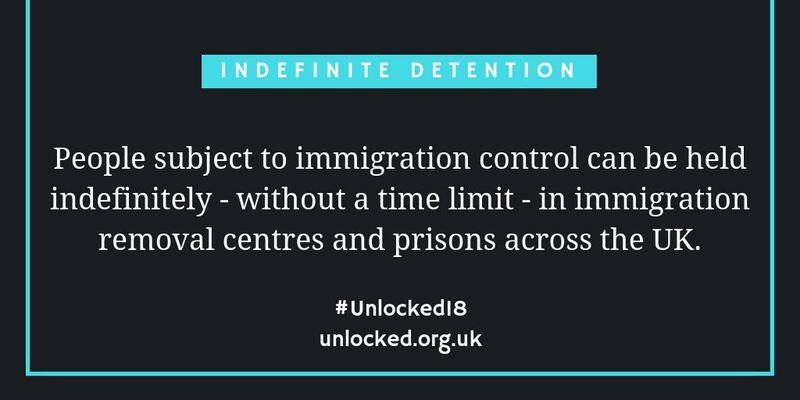 As the NGO Medical Justice found in a report on the practice of segregation, the ‘main utility’ of these units ‘is to contain risk rather than to provide care or support.’ Women and men held in detention call it the ‘black room’. The point is that, if a system is inhumane, it can only be described in either ugly language, or the turd is given unconvincing polish. Put simply, the truth is violent, and the only way out of this quandary is to dismantle the violent system. One way to challenge the system is to resist its terminology. Extreme care needs to go into the language used in this field, and every effort needs to be made not to simply fall into using the terms set by the Home Office. The dialect of dehumanisation is so pervasive and ubiquitous that we no longer notice when we’re speaking it. Dr Alpa Parmar has argued that the most appropriate metaphor for the ‘everyday everywhere bordering’ of the hostile environment is a mirror. By reflecting our own image, the mirror forces us in turn to reflect on ourselves: who have we become?